Stand tall with a loaded barbell on your thighs. Tighten your core, dip down slightly, and powerfully pull the barbell up on top of your collarbone. Explosively press the barbell overhead. Hold for 1s, slowly lower the bar back to your collarbone, and then drop it down to your thighs. Complete each clean & press in one fluid motion. Repeat for a full set. Tip: Do a calf raise when the bar is at the top of the movement. Sit upright in a squat rack so that the barbell is positioned overhead. Grab the bar slightly wider than shoulder-width. Pull the weight off the rack and lower it down in front of your face. It should be slightly above your collarbone. Powerfully press the bar overhead. Keep your core tight and resist any tendency to arch your back. Hold for 1s at the top and slowly lower it back down until your triceps are slightly below parallel. Repeat for a full set. Tip: Stand to up the difficulty and increase core engagement. Load one side of a barbell and stick the other end firmly against a wall. You can also stick it in the center of a weight plate. 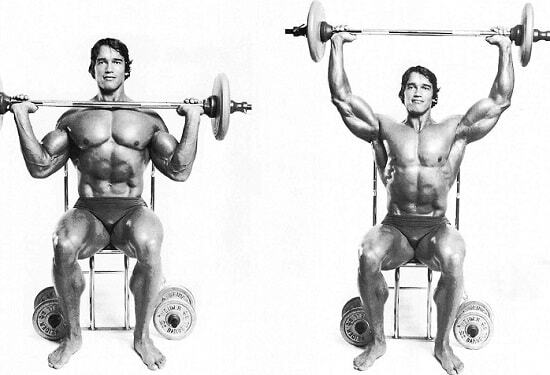 Hold the top end of the barbell with your left hand and place it over your shoulder. 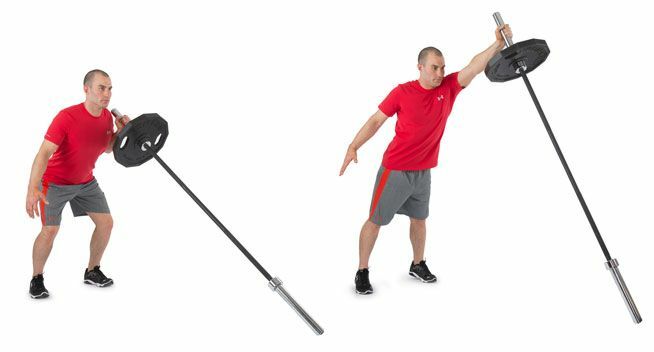 Powerfully dip down, explode up, and press the bar up overhead. Hold for 1s and lower back down. Squeeze your core and keep it braced the entire time. 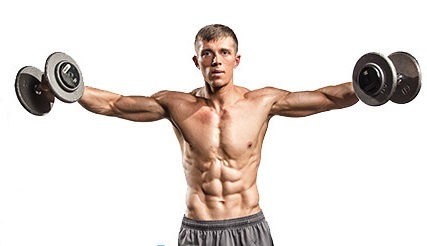 Complete a full set and repeat for the opposite arm. Tip: Crunch down into your core at the bottom of every rep. It burns. Grab two dumbbells and bend over so that your torso is at a 45º angle. Keep your back straight. Squeeze your shoulder blades together and powerfully raise both arms directly out to the side. They should stay in-line with your chest. Hold the contraction for .5 seconds at the top and slowly return down to the bottom. Tip: Hold the contraction at the top for 2-3 seconds to burn out your rear delts.